Say No To Dog Meat – Demonstration, Rescue and Rehabilitation. 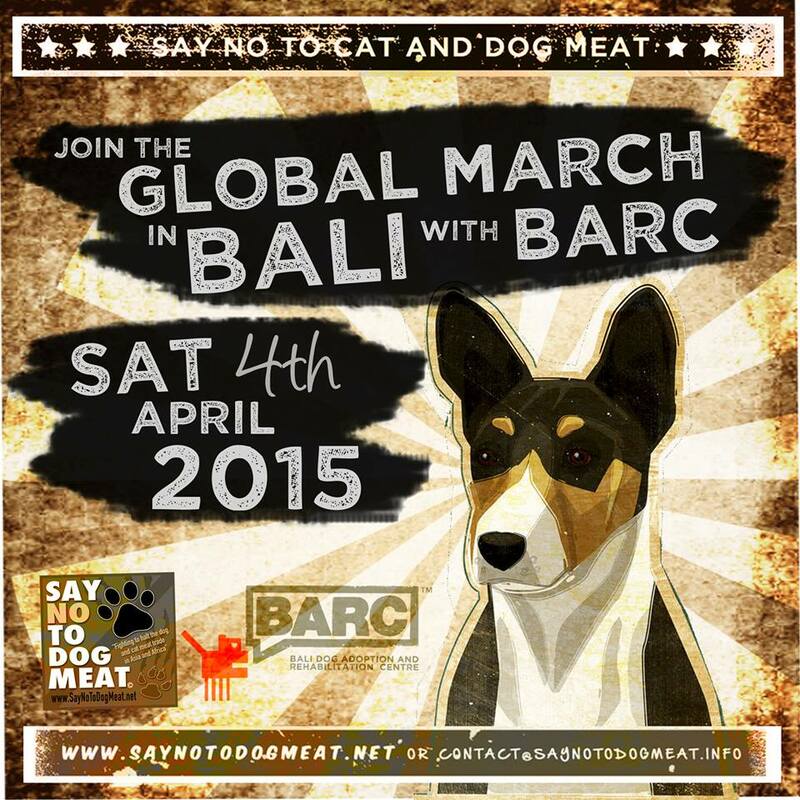 An organisation called Say No To Dog Meat.Net are holding an event on the 4th April 2015 at 10:00 am internationally. The event that’s been in the planning since last year is to be held in many countries from London, Australia, Canada, America, Serbia, Indonesia, South Africa and more. For more information on Say No To Dog Meat’s global demonstration please click this >here< that will direct you to their Facebook page event forum. Say No To Dog Meat was formed by three Chief Executive Officers that work within the environmental and animal rescue sector. The organisation has to date attracted hundreds of thousands of people worldwide, readers and supporters to their cause. Say No To Dog Meat is within the transition process of becoming an Australian registered charity, furthermore have recently purchased a run down derelict building within Viet Nam of which will be their main Asian pet medical rescue and rehabilitation clinic. Once dogs and cats are safe from the clutches of pet eaters, traders and snatchers they will be re-homed internationally to loving and caring adopters. The rescue and rehabilitation clinic is incredibly important to the three Chief Executive Officers their volunteers and staff. Say No To Dog Meat’s rescue and rehab clinic will be one of few such rescues within Viet Nam that actively help to remove strays of the streets within Viet Nam that have no home thus removing dogs and cats from the snatchers clutches whom feed into the cruel and diseased pet meat trade. B.A.R.C. IS ALSO MARCHING WITH Say No To Dog Meat in their Global March for dogs and cats in the meat trade; 10am Saturday April 4th, 2015. Will you be marching with them too, in your country? For more information email Say No To Dog Meat here at – contact@saynotodogmeat.info for a march location in your country. Say No To Dog Meat are unique as their main ambition is not only to end the pet meat trade within Asia and Africa but also the cruel and barbaric bushmeat trade that poses a serious disease and health risk threat to humans and animals. The term bushmeat, also called wildmeat and game meat, refers to meat from non-domesticated mammals, reptiles, amphibians and birds hunted for food in tropical forests. Commercial harvesting and the trade of wildlife is considered a threat to biodiversity and human security. Should the bushmeat trade trade continue to be ignored we’ll see catastrophic declines of wildlife in areas of Africa and Asia of which extinctions are already occurring both locally and regionally of some exotic species. Say No To Dog Meat also appeals to all tourists visiting Viet Nam to please refrain from making their jobs harder to ban the trade. Its commercials such as this seen below that only feed the trade. Say No To Dog Meat’s founders have decades of experience fighting this inhumane industry and have worked hard to achieve unprecedented access into areas of the trade not readily accessible to most outsiders. The organisations investigative work allows them to gather current, accurate and up-to-date information and images, evidence that is paramount in spreading global awareness and pressuring governmental organizations to enact enforceable animal welfare laws that protect companion animals. Ultimately, the organisations intention is to help create meaningful social and governmental change that results in a more humane world for dogs and cats and wildlife endangered by the bushmeat industry. The organisation is determined to expose the cruel and ruthless activities within the dog and cat meat trade that are perpetrated by dog farmers, cat farmers, animal traffickers, butchers, vendors and dog and cat eating customers. “This is a billion dollar industry” Co-Founder Donna Armes stated, centered on live companion animals being tortured, killed and served as menu items. “It is a gruesome, violent trade that must be halted” stated Michelle Brown Director of Say No To Dog Meat and Co-Director for International Animal Rescue Foundation Africa. Video below shows Viet Nam dog snatchers this October caught on CCTV – these dogs are most likely now dead – fed into a cruel and horrific pet meat industry, Say No To Dog Meat aims to stop this with new laws they are lobbying the Viet Nam government with on two separate petitions. By tackling poverty in the nations of Africa where dog meat is being consumed, Say No To Dog Meat will work with aid organisations and companies, as well as welfare groups and communities. Founder Dr Jose Depre states “we are positive that by improving dietary needs and wiping out poverty in these small areas of Africa, we can wipe out the dog meat trade and black market, thus decreasing infectious diseases, rabies, H1N1, mutations and food poisoning”. 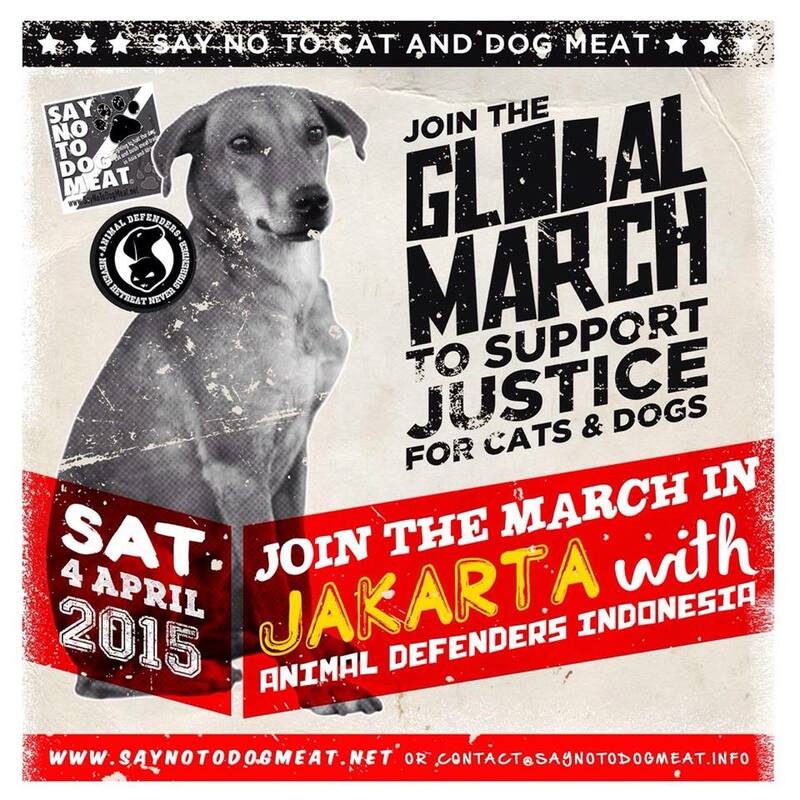 INDONESIA IS MARCHING WITH Say No To Dog Meat in their Global March for dogs and cats in the meat trade; 10am Saturday April 4th, 2015. Will you be marching with them too? For more info email Say No To Dog Meat.Net @ contact@saynotodogmeat.info for a march location in your country. INDONESIAN SUPPORTERS: please join Animal Defenders Indonesia in the JAKARTA march. Founders of Say No To Dog Meat aggressively opposes legislation that promotes or legalizes companion animal slaughter. They do not believe in the myth of “humane meat,” reject the concept of “humane slaughter” and strongly believe that dog and cat butchers cannot be relied upon to implement “humane” practices. The organisation founders also oppose dog farmers, cat farmers, slaughter unions, individual farmers or any persons being permitted to “farm” small numbers of dogs and/or cats for personal consumption. In addition, they are against dog and cat elixirs and tonics, despite (unproven) claims of their health benefits. Through educational efforts, Say No To Dog Meat hopes to enlighten the global public about the miserable lives farmed companion animals face and how this trade impacts dogs and cats throughout the world. Education will also be provided for those wishing to adopt rescued animals from the live meat trade. These animals have been through varying degrees of trauma, so guidance is needed in ensuring adoptive families understand the process of restoring their new pet’s health, happiness and well-being. In addition, Say No To Dog Meat will provide education for people in dog and cat eating countries who wish to learn about responsible pet ownership and providing safe, long-term environments for dogs and cats as loved family members. 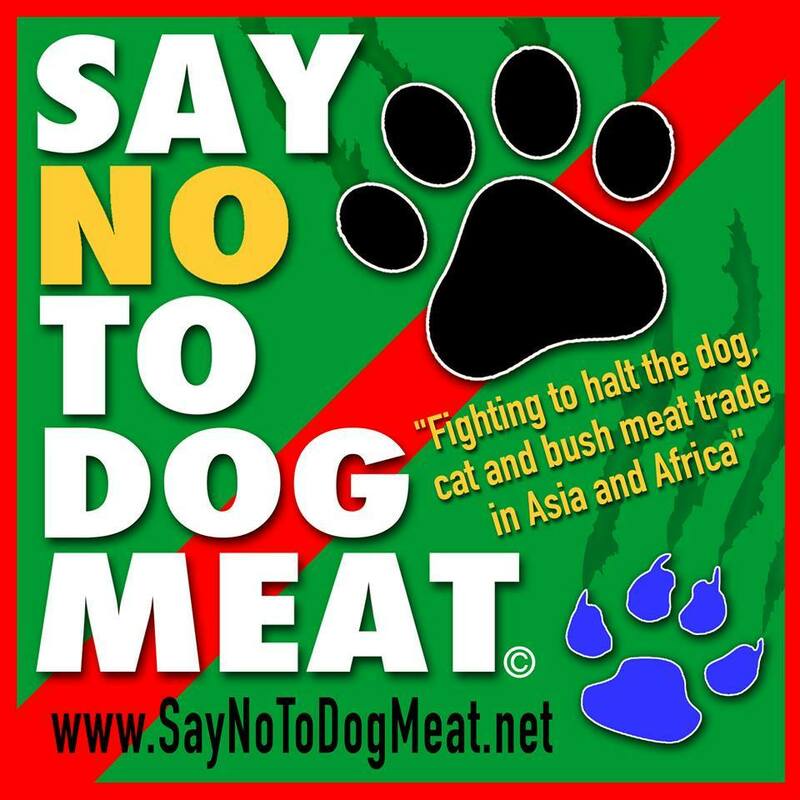 Say No To Dog Meat has commenced fundraising, from which their efforts will include rehoming rescued dogs and cats from the live meat trade once the Viet Nam rescue and medical clinic has been established. “All fundraising will be conducted with full transparency and information pertaining to our monetary activities will be made readily available” stated Michelle Brown wildlife rescue specialist that resides in Australia. Donna Armes that resides now in Canada stated “participating in Say No To Dog Meat campaigns and signing our petitions supports our work furthermore to bring change for a better world for dogs and cats victimized by this trade”. “We invite you to join our fight to halt the live dog and cat meat trade and Say No To Dog Meat” stated the team of elite environmentalists and animal rescuers. Say No To Dog Meat’s donation link is below. The link will direct you to their Facebook page from which you can also subscribe to their site for news and events plus lots more. The organisation now requires public funding to help establish their rescue and medical facility for dogs and cats in Viet Nam and hopefully over the borders too. Say No To Dog Meat requires funding for renovation, water, gas and electrical services to be reinstated, pet triage and surgical clinic, rehabilitation and special needs area, isolation clinic, cages and pet boxes, surgical equipment, bedding and blankets, medical supplies, food, and much more. Once the rescue and rehabilitation clinic is fully operation specialist staff employed will then commence rescuing strays from the streets of Viet Nam of both sick dogs and cats and pets in need of a loving forever home. There’s more too. The organisation will also be holding rabies and vaccination clinics to help reduce disease and decrease rabies within the country and over the borders. Lastly while Say No To Dog Meat recognizes the honest work undertaken by groups of Asian activists that actively seek out pet meat traffickers – no animals that Say No To Dog Meat’s staff rescue will come from traffickers or butchers that require payment. “What’s the point in paying pet meat traffickers and marketeers just for them to purchase more dogs and cats from public funding” stated Jose Depre, “that is defeating the main objective and continues to feed the pet meat trade, were here to help and rescue pets not to continue a trade a circle of abuse”. This entry was posted on December 30, 2014 by speakupforthevoiceless. It was filed under You must be the change you want to see in the world and was tagged with abuse, animal abuse, animal rights, anti pet meat demonstration, bush meat trade, cats, demonstration, dog meat, dogs, dogs and cats, donate, donate today, Donna Armes, Jose Depre, Michele Brown, pet meat trade, say no to dog meat, viet nam.